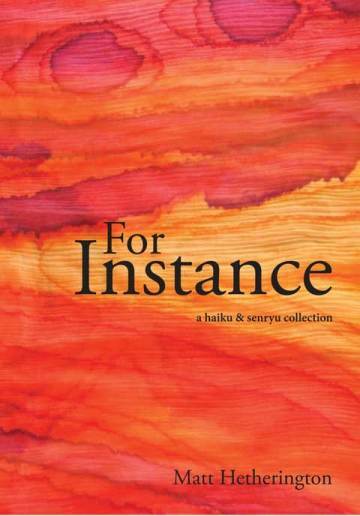 For Instance: A Haiku & Senryu Collection by Matt Hetherington. Mulla Mulla Press 2015. For Instance, a haiku & senryu collection by Matt Hetherington traverses “three journeys”. Spanning 2004 to 2011, it is an account of observations through India, a significant relationship and Morocco. The 60 pages are broken into 3 sections; “sweeping the dust”, “puddles” and “the horizon”. The result is a series of “snapshots” recorded in the English language style of modern haiku. Rose Van Son in her book Three Owls and a Crescent Moon 2014 states, “The key is to simply write and to write simply” and this is what Hetherington does. Bravely, he opens his heart and invites us to share his journeys, both literal and metaphorical. In her “3CR Spoken Word” interview with Haiku Poet, Myron Lysenko 24th May 2015, Ela Fornalska recalls Matt Hetherington saying on a Ginko (paraphrased) If it’s not written from experience then it’s not haiku, it’s just a short poem. The font is easy to read. The layout is spacious; three haiku per page allows room for the reader to ponder the layers of meaning they provide. Whilst the structure and shape differ from the traditional masters of classic Japanese Haiku 17th – 19th centuries, the process of the pilgrim poet is the same. The collection includes classical elements of “sabi” beauty in loneliness and “wabi” beauty from living simply. For me, For Instance contains a lesson on how to write interesting, unique haiku. This is Matt’s authentic, intimate account of three journeys. It’s not Eat, Pray, Love and that, is refreshing. With haiku, the whole is greater than the sum of its parts. The same is true with For Instance. Lines of observation provide the weave and the layout, the weft for an honest piece of material. This entry was posted in For Instance: A Haiku & Senryu Collection, Issue 15, Matt Hetherington, Mulla Mulla Press, Tash Adams, Uncategorized and tagged 3CR, Australian Literature, Ela Fornalska, haiku, Myron Lysenko, poetry, Rose Van Son, Three Owls and a Crescent Moon by Mark Roberts. Bookmark the permalink.